Plant a tree in memory of Jesse "Jack"
Be the first to share your favorite memory, photo or story of Jesse "Jack". This memorial page is dedicated for family, friends and future generations to celebrate the life of their loved one. Jesse L. “Jack” Bailey, 88 of Hwy 23 West, Modoc passed away Monday, September 11, 2017. He was the husband of the late Mary Frances Bailey. Funeral Services will be held Friday, September 15, 2017 at 11 AM at Red Oak Grove Baptist Church with burial to follow in church cemetery. Jack was a native of Edgefield County. He was a member of his beloved Red Oak Grove Baptist Church where he lovingly served as Deacon and was also a Mason, Shriner and he was a member of the American Legion. 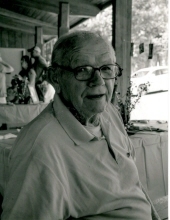 Jack retired from S.C. National Guard in Edgefield as a Mechanic. He also worked many years after retirement at Crouch (Ace) Hardware Store of Edgefield. Survivors include 2 daughters, Jacalyn (Ronnie) Burden, and Rose (Larry) Miller; 1 son John (Susan) Bailey; 1 brother Tandy (Betty Ann) Bailey; 1 sister, Inez (Jim) Chavez. He will be lovingly missed by his six grandsons’, Scott, Ron, Will, Drew, Colin, and Chris, and six great-grandchildren. Memorials may be made to Red Oak Grove Baptist Church, c/o Phillip Trotter, 66 Flat Rock Rd. Modoc, S.C. 29838. The family is at the home of John and Susan Bailey and will receive friends Thursday from 6 to 8 PM at Edgefield Mercantile Funeral Home. To plant a tree in memory of Jesse "Jack" Leon Bailey, please visit our Tribute Store. "Email Address" would like to share the life celebration of Jesse "Jack" Leon Bailey. Click on the "link" to go to share a favorite memory or leave a condolence message for the family.